Greenberg Realty Mobile App | Also Creative Inc.
We recently had the privilege of working with an outstanding community leader and premier real estate firm, Greenberg Realty, to create a native mobile application that highlights their brand, area properties and agents. The Greenberg Realty mobile app has a clean and simple interface which makes it effortless for buyers to operate. The app can conveniently be downloaded for free in the app store on any iOS or Android device. Using the search and filter functions buyers can view houses in their price rage with the number of bedrooms, bathrooms, and square footage they are looking for. They can even filter by the age of the home and the number of days the house has been listed. Properties can also be sorted by residential, condos/townhomes, multifamily, lake properties, lots/land, mobile homes, and even commercial properties suiting every buyer’s needs. When scrolling through properties buyers are able to use the ‘favorite’ button to mark the homes they love the most. This generates a personalized favorites list which provides an easy way to keep track of the properties the buyer would like to see. Hiding homes you dislike is just as easy. 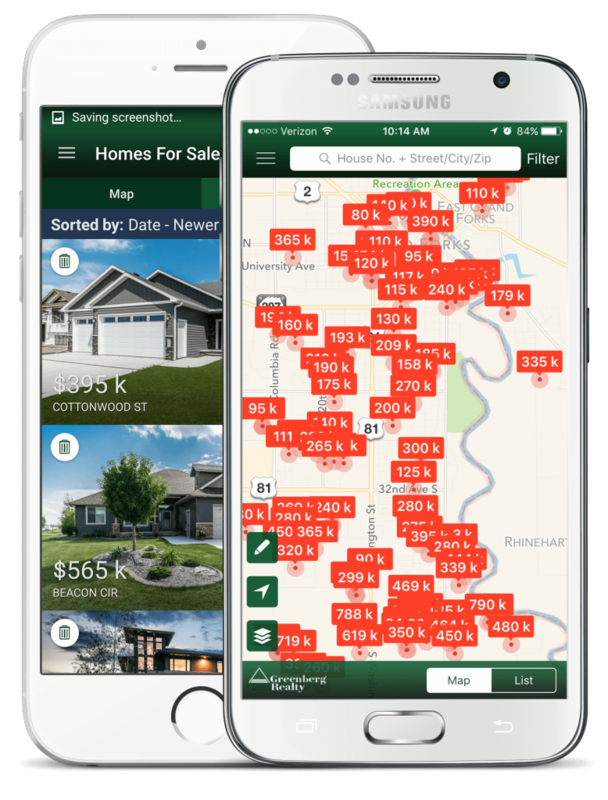 By simply swiping left or selecting the hide button, the homes will disappear from the list of homes for sale. If the user changes their mind, by selecting the hidden homes list they can easily add the home back to the homes for sale list, or to their favorites. When a property is selected, the buyer is brought to a screen dedicated to the property, which gives a description of the home along with the option to view the home on a map, driving directions, scroll through full screen photos, or the ability to directly contact their realtor or share the property with a friend. Using the preferred agent feature, buyers are able to select the agent that they are working with from the agent directory. This will automatically update the contact information under each property to this agent making communication between the agent and the buyer a breeze. If a future home buyer does not have an agent but wants to work with Greenberg, the agent directory is a great way to get started. In the age of mobile, buyers expect the most up to date information possible at their fingertips. Using MLS, Greenberg is always up to date when new listings enter the market. Using map based search buyers are able to view homes in their favorite neighborhood, and avoid browsing through listings outside of their desired location. The drawing tool allows users to even more accurately find homes in a specific desired area. If you haven't checked it out yet, head to your app store and download the Greenberg Realty mobile app! Available on Apple and Android.